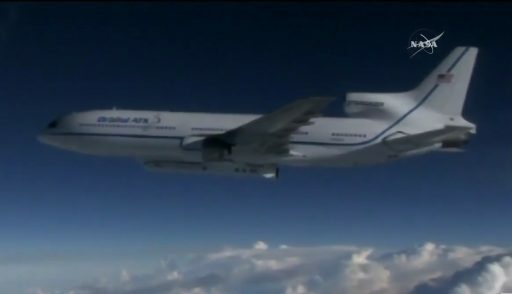 The launch of NASA’s CYGNSS hurricane research satellite constellation has been delayed to Thursday due to an issue related to the spacecraft flight software that needs closure before the winged Pegasus rocket can be dropped from its L-1011 carrier craft and power its eight miniature payloads into orbit. The problem – related to an issue with flight parameter data used by the CYGNSS spacecraft software – was discovered on Tuesday and new flight parameter data has been tested on the satellite engineering model and is ready to be uploaded to the satellites on Wednesday. The software update was successfully carried out and the launch was firmed up for Thursday during a one-hour window opening at 13:26 UTC. 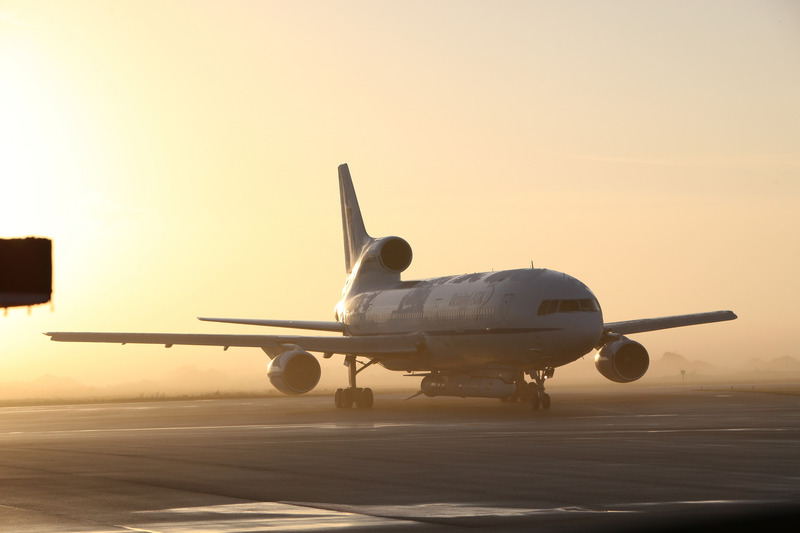 Meanwhile, the L-1011 aircraft – the primary driver in Monday’s launch scrub – has undergone repairs and re-tests and is ready to support the mission when a new launch date has been set. Should launch not be possible on Thursday, Pegasus may be facing an extended delay due to a conflict on the Eastern Range as an Atlas V has a firm launch date booked on Sunday. The launch of NASA’s CYGNSS hurricane science mission had to be aborted on Monday due to a range of issues cropping up during an airborne countdown aboard the L-1011 aircraft carrying the winged Pegasus rocket toward an intended drop point over the Atlantic Ocean. Primary drivers during Monday’s countdown were difficult weather conditions along with a balky hydraulic pump on the carrier aircraft. Radio nets were busy as teams worked in parallel to coordinate with the meteorology group and a busy onboard crew that was working up to the last minute of the countdown to restore power to a hydraulic pump that had gone down while the aircraft was en-route to the drop point. With no joy in their troubleshooting efforts, crews had to abort the day’s operation and return to base for repairs. Later on Monday, Orbital ATK announced a new launch attempt could be made on Wednesday at the earliest because a replacement part has to be flown in from California to restore functionality of the hydraulic system. 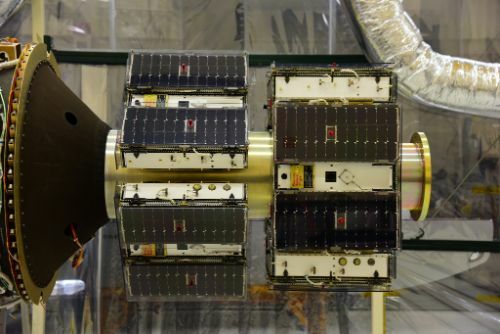 The $157 million project, known as the Cyclone Global Navigation Satellite System (CYGNSS), aims to deploy a constellation of eight miniature satellites outfitted with a high-fidelity receiving system to pick up GPS signals after they bounce off the world’s oceans to extract wind data. 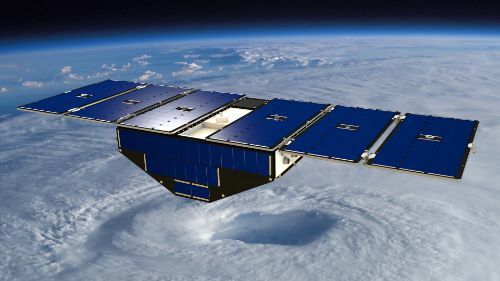 GPS signals penetrate even the thickest rain bands, allowing CYGNSS to peer where conventional sensors can’t look – the most intense regions of cyclones where rapid intensification processes are at work. 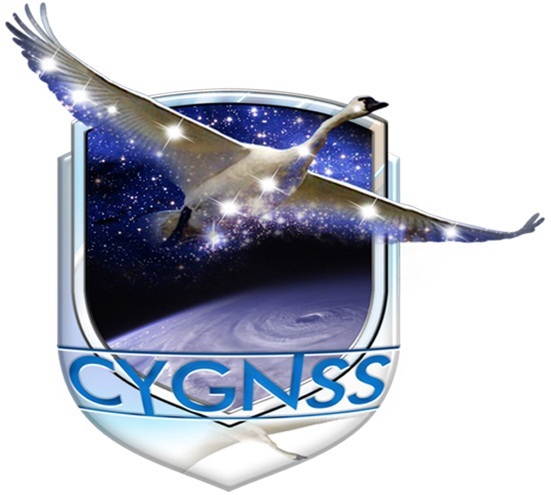 CYGNSS is the 43rd mission operated by the Pegasus launcher and marks the rocket’s return to Cape Canaveral for the first time since 2003. Fastened underneath the L-1011 ‘Stargazer’ aircraft, Pegasus was planned to be launched during a one-hour window opening at 13:19 UTC. 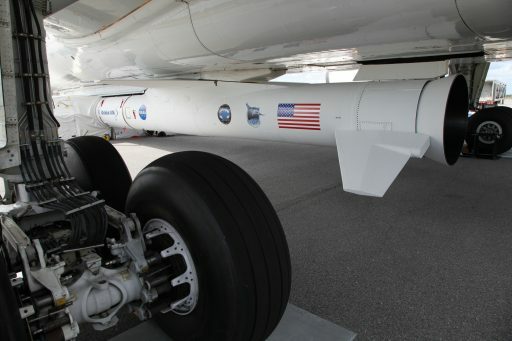 Pegasus headed into a five-hour countdown at 3:14 a.m. local time on Monday with ground teams putting the final touches on the rocket and aircraft before the flight crew boarded the plane. 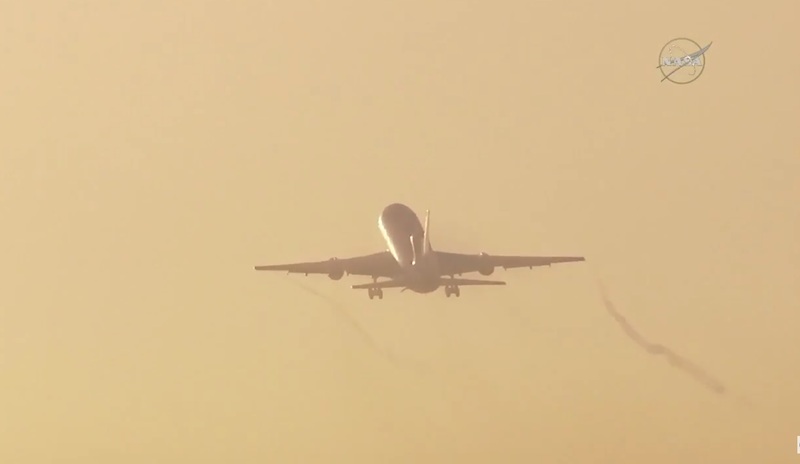 A dense layer of fog formed over Cape Canaveral’s Skid Strip runway and required the L-1011’s takeoff to be pushed by 15 minutes to allow the sun to burn off some of the fog in order to create favorable visibility. 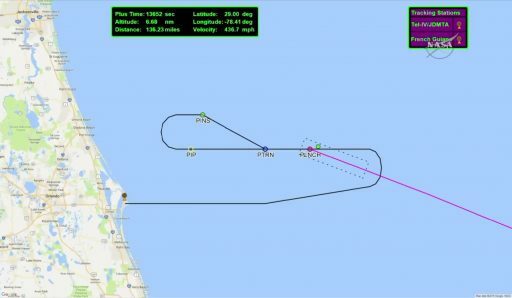 The TriStar aircraft accelerated down Runway 13 at 12:37 to begin heading to the drop point, 12,400 meters in altitude and around 160 Kilometers due East of Daytona Beach in a 10 by 40-nautical mile safety zone established for the mission. Weather was a known issue heading into the launch operation and the launch team was in constant communication with the meteorology group to discuss where the drop should be placed within the launch zone to meet the strict weather requirements for the rocket’s atmospheric ascent. En-route to the drop point, the flight crew came on the radio net reporting a failure of a critical hydraulic pump located in the release system of the Pegasus rocket and required to open the five hooks that hold the rocket in place on the underside of the aircraft. Typical troubleshooting steps such as re-setting circuit breakers, mechanical action on the pump and checking electrical relays did not bring any joy – prompting the launch team to call an abort of the first launch attempt. The particular pump has to be up and running to ensure a clean separation of the Pegasus rocket. It was tested on the ground in the days prior to Monday’s attempt and again as part of the early morning countdown when it powered up without any issues. With the first attempt called off, the pilots focused on bringing the airplane around for another go while, in the back of the aircraft, a valiant effort began to diagnose the pump issue. Working with the engineering team on the ground, the onboard crew attempted multiple times to put the circuit breaker back in, however, some issue downstream caused the circuit breaker to trip again and again. Setting up a 14:05 UTC drop attempt, Pegasus was once again configured to head to internal power, however, the hydraulic pump remained No-Go at the T-4 minute mark, prompting another abort call. Subsequently, L-1011 was instructed to return to base with touchdown on Cape Canaveral’s Skid Strip around two hours after the initial take off. With the carrier plane back on the ground, Orbital ATK engineering teams completed an assessment of the hydraulic system and concluded a replacement component needed to be flown in from Mojave, California – pushing the launch until NET Wednesday. The hour-long launch window opens at 13:20 UTC. Monday’s scrubbed attempt marked the eighth time Stargazer had to return to base with Pegasus still attached.